Simple Dishes | eat. live. paleo. Yesterday I came home from three days in Chicago. It was a quick trip with mostly late nights, random eats and a lot of drinks, so when I finally made it home after my several-times delayed flight, all I wanted for dinner was something simple. In the fridge I had baby eggplants and mushrooms that needed to be used, so in a pan with olive oil I sautéed diced onions, minced jalapeño chili, mushrooms (portabella, sliced, and beech, broken up in pieces), baby eggplants (cut in about 1 in pieces), seasoned with salt; once the vegetables were cooked, I deglazed the pan with a drizzle of aged balsamic vinegar and threw in about a tablespoon of capers. I added some chopped basil for freshness and color, and, voilá! Dinner for one (with enough for leftovers) was served. 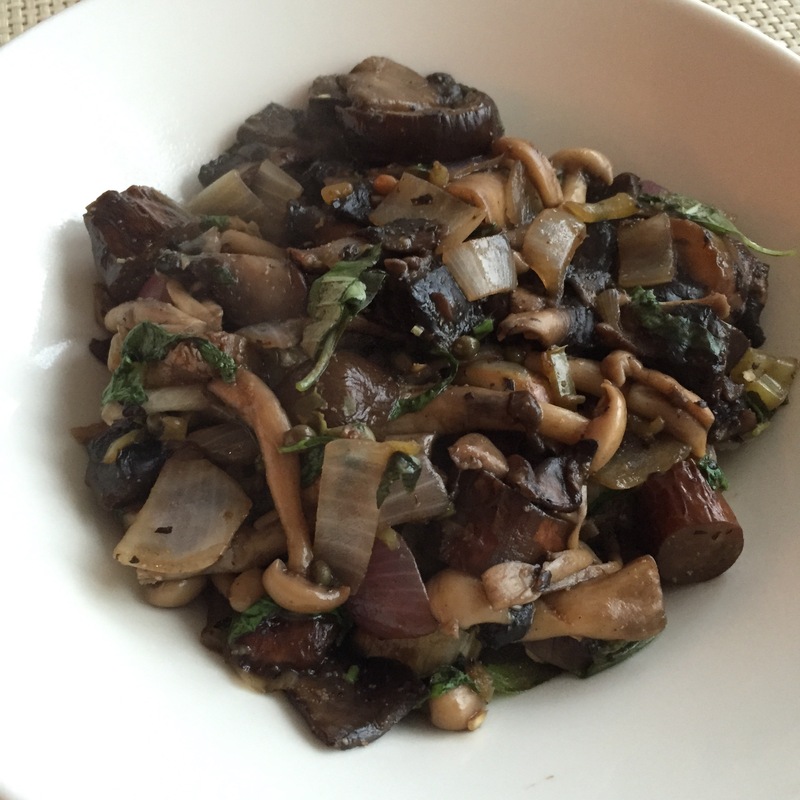 Sometimes a hearty umami-ful veg dinner really hits the spot! Heirloom vegetables are so gorgeous and delicious, especially in the summer. Our dinner last night was wild coho salmon. For vegetable accompaniments I made what I like to call Italian-style tomato salsa/salad and roasted rainbow carrots. The tomatoes I chopped up and mixed with finely chopped red onions, minced jalapeño pepper, chiffonade basil and capers, seasoned with salt, pepper, and a drizzle of aged balsamic vinegar. 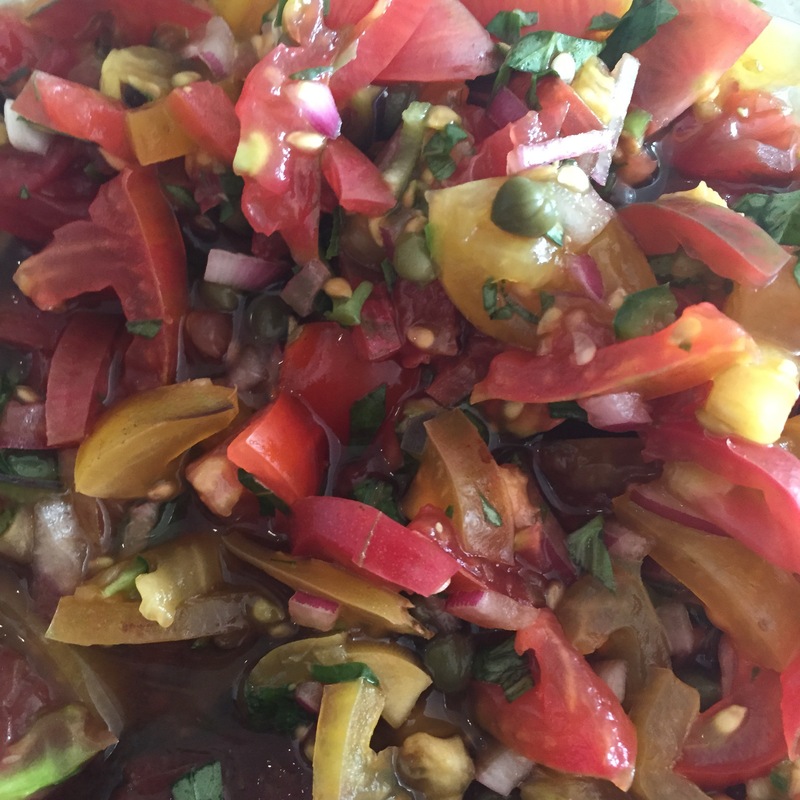 The jalapeño gives the salad a nice kick, while the aged balsamic brings out the sweetness of the tomatoes. 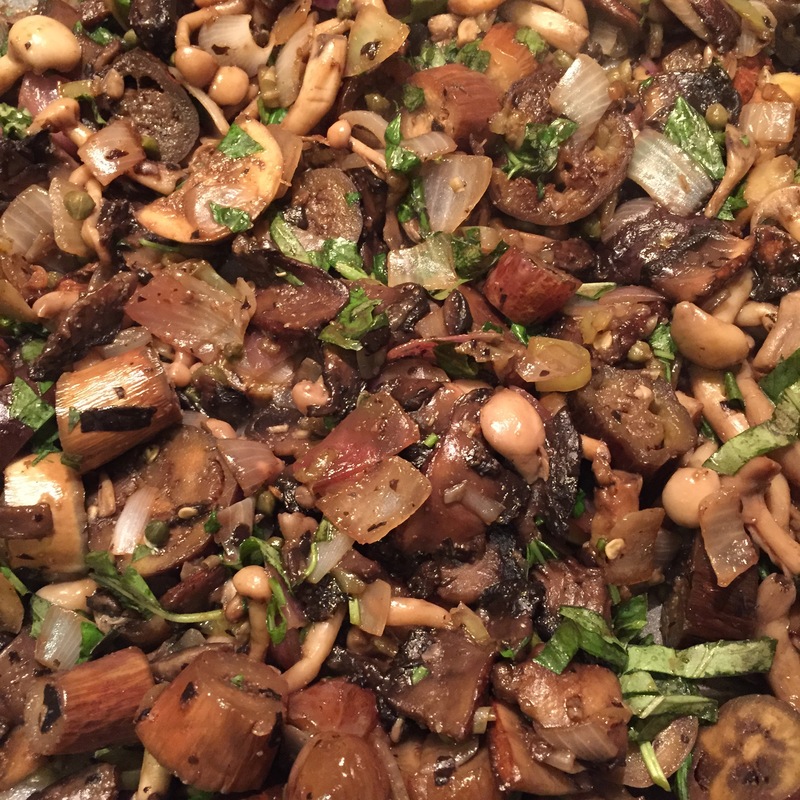 The capers add a salty, briny quality. We love this salad to go with a variety of proteins as a topping, or just to eat with corn chips, much like a salsa. As for the carrots, I scrubbed them clean and cut them them into about 1/4 inch thickness, skin on, taking off just the ends. 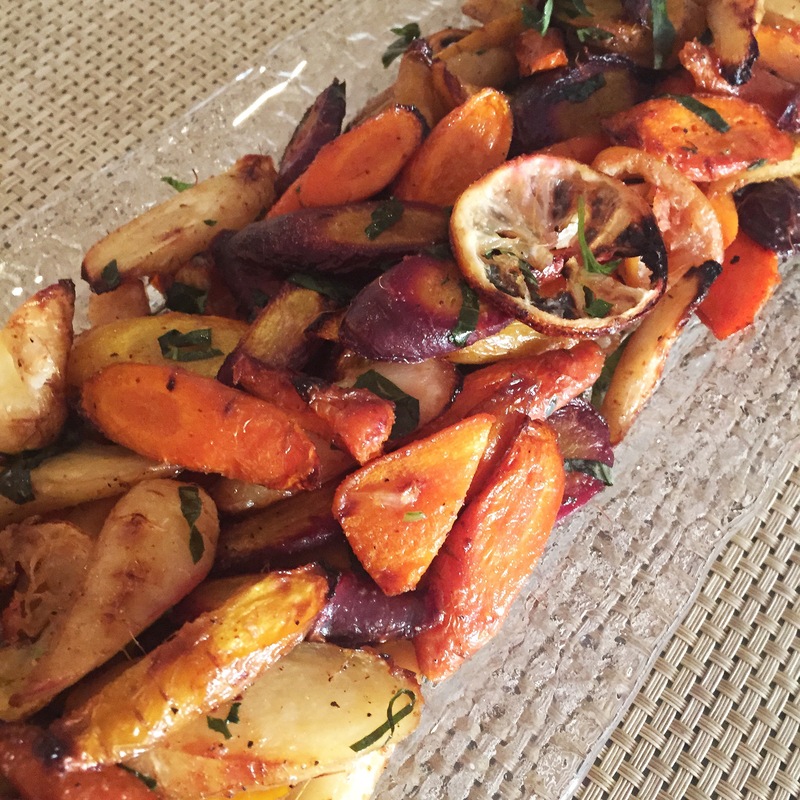 Laying the carrots onto roasting pans — making sure not to over crowd them — I gave them a few good glugs of olive oil, about two table spoons per pan, and mixed thoroughly so all carrot pieces were coated with oil. I added a few slices of lemon. Normally I would add whole cloves of garlic, skin on, but sadly I was out of garlic — so I sprinkled some garlic powder over the carrots instead. I roasted the carrots in 400F oven, occasionally mixing them around in the pan, until cooked, about 50 minutes. I wanted to “char” the carrots a bit, so at the very end I set the oven to medium broil for about 5 minutes to crisp up the edges. Once out of the oven I seasoned the carrots with salt and pepper, and threw in some finely chopped basil. 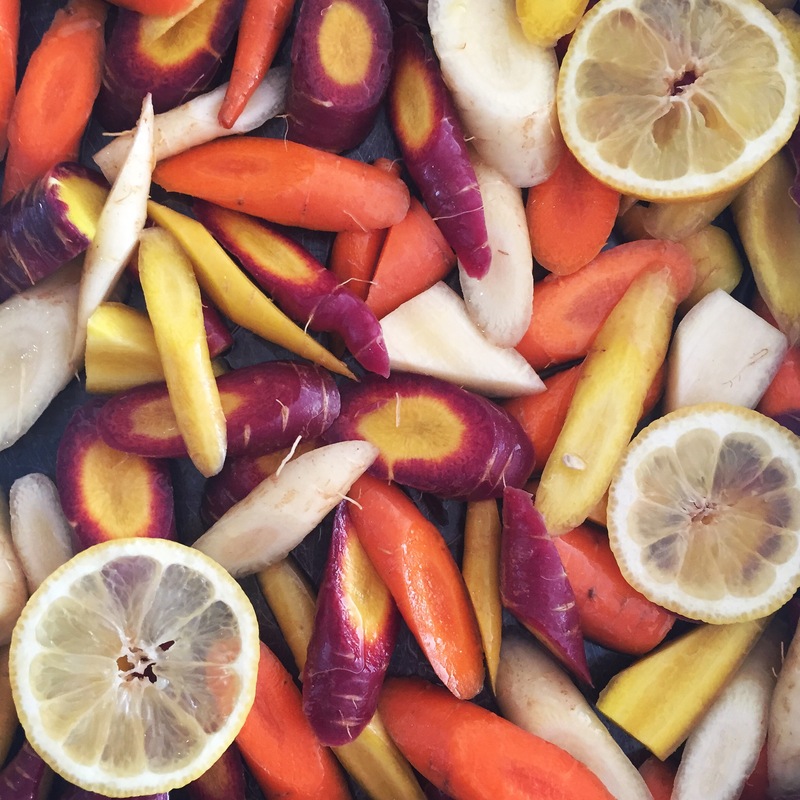 I think the lemon works very well with the carrots, as it adds a brightness that complements the natural earthy sweetness of carrots. So simple and yet so flavorful! Summer vegetables are so wonderful. What seasonal vegetable are you cooking these days? Whole Foods had a big sale on wild sole last week, which inspired me to think of an easy way to eat a lot of the delicious fish. I happened to have a lot of fennel in the fridge, and so I experimented with cooking the sole and fennel together — and discovered our new favorite way to cook sole! 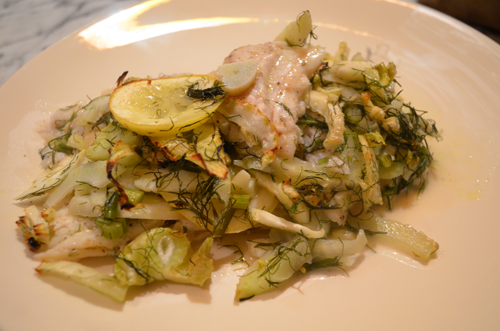 The fennel and lemon pair perfectly with the fish. Baking the fennel brings out a lot of the vegetable’s flavor and sweetness, and the lemon and garlic add a nice zesty quality to the dish. The sole is so moist and flavorful! This dish should typically serve about 4 people, especially when accompanied with another side vegetable, but, truth be told, it was so light and delicious we ate the whole thing when I made it last night! This recipe will be a nice addition to my work-week dinner roster, as it is so simple to make and healthful, too! We have a fantastic butcher here in Park Slope called Fleisher’s. Fleisher’s carries fabulous quality meats free of hormones or antibiotics, which are locally sourced and raised on a primarily grass-fed diet. We love everything from them. Yesterday, we stopped by Fleisher’s and picked up some pork chops, steaks, and some “bork” — ground beef and pork mix. For late brunch today, I used the bork to make some spicy “bork” mince with onions, capers and parsley, topped with scrambled eggs. So easy to make and packed full of flavor! The capers add a nice tangy flavor to the spicy mince meat, and the parsley gives the dish a lovely freshness. 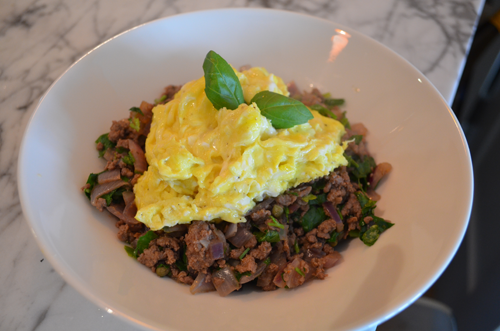 Eat with some scrambled eggs, and you’ve got a great protein-packed brunch in a bowl! A high school friend of mine and his girlfriend are on the raw food diet and are also vegetarian. A while back over drinks, they told me about the wonders of the spiral slicer that can create beautiful spirals of vegetables — a perfect gadget for raw foodists, who, with it, could make raw vegetable “pastas” from carrots, zucchinis and the like. The idea of the spiral slicer stayed on my mind, and so I finally purchased one recently. There are a few types of spiral slicers out there, but I went with the Gefu Spirelli — and I LOVE it! I first learned to make guacamole at an all-inclusive resort in Mexico, where one of the activities was a cooking demonstration. Ever since, guacamole has been a regular party staple in our household. Who doesn’t like guacamole? Fresh and flavorful, guacamole is excellent all year round. There’s room to play in making guacamole. Normally, I use a habañero pepper (about 1/2, deseeded), but you can also use serrano or jalapeño peppers, depending on your preference. Recently, we like using serrano peppers because they have a good balance of heat and flavor (David calls it “umami”). A few of my friends don’t like cilantro, in which case I’ll swap out cilantro for basil and make what I call “Mediterranean” guacamole. 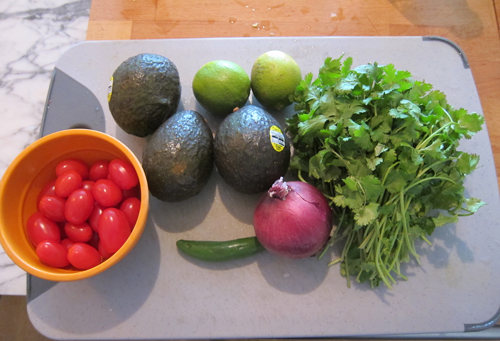 Although traditional guacamole uses yellow onions, sometimes I like to use red onions, which are sweeter. 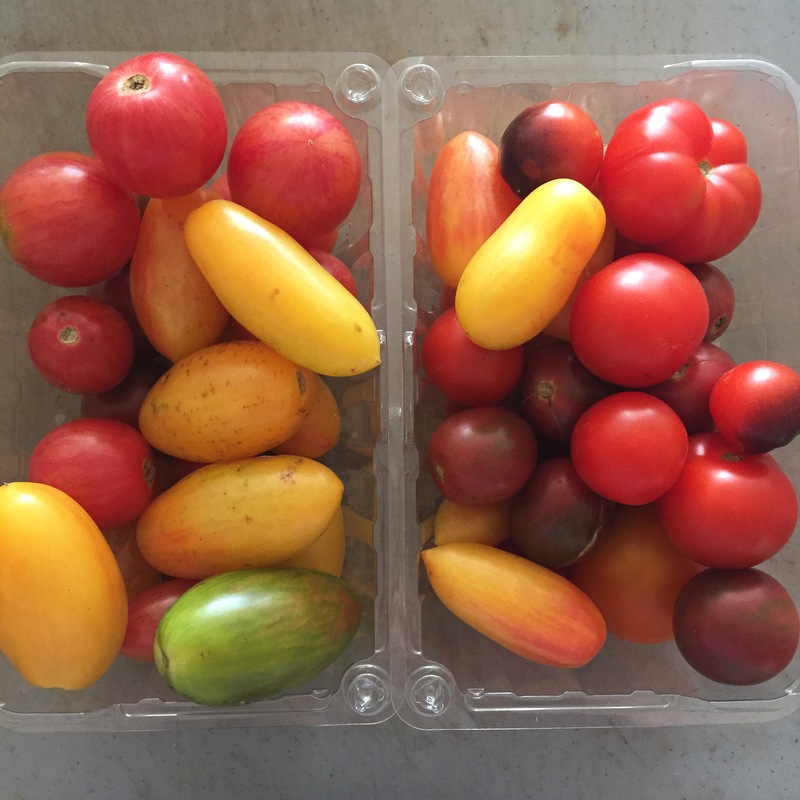 You can use heirloom tomatoes or cherry tomatoes or beefsteak tomatoes, depending of what looks best at the market. I like my guacamole crunchy, so you can definitely play with the ingredient ratios. Sometimes, we just feel like eating a nice big piece of fish for dinner. Wild sockeye salmon is one of our favorite weekday fish, because it is so quick and easy to cook. 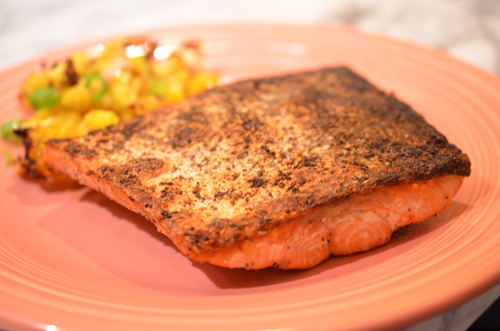 It takes less then 10 minutes to pan-sear sockeye salmon filets to crispy-skin perfection. Sockeye salmon is firmer than your regular salmon, with deep, orange-red color and rich, full, salmon-y flavor. It is leaner than King Salmon, and less expensive. I think sockeye salmon is best cooked simply — just make sure to not over cook it, as it will dry out. Since David and I try to avoid eating farmed salmon as well as salmon with “added color” (usually goes hand in hand), sockeye salmon has become our favorite salmon variety to cook at home (along with coho salmon, which, when in season, is also delicious). Currently, sockeye salmon found in super markets tend to be “previously frozen” (i.e. not in peak season), but we think they still taste delicious! 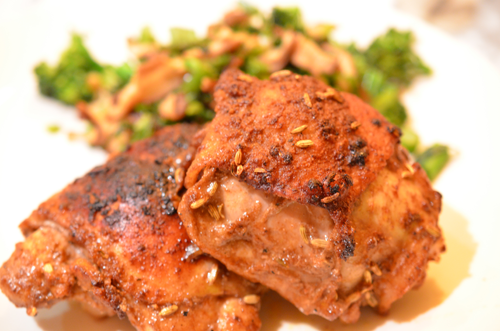 My Spicy Lemon Paprika Chicken Thigh recipe is one of the most frequently visited posts on my blog — I think because we all love a simple but flavorful way of oven roasting skin-on chicken thighs (and indulging in deliciously crispy chicken skin). I recently created a variation of the recipe, a marinade with more spices — I wanted to layer on more flavor in the marinade and see what happened. The result was excellent, and also different, so I hope everyone who has tried the Spicy Lemon Paprika recipe will try this new recipe, too! What I like about this new marinade is the slight sweetness from the cinnamon, as well as the aroma of fennel seeds as well as a hint of cloves. 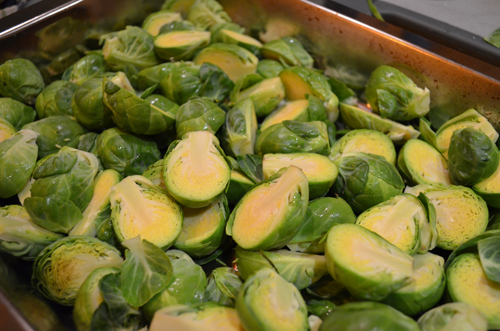 Brussels sprouts and bacon pair perfectly together, and we love them roasted to crispy perfection in the oven! 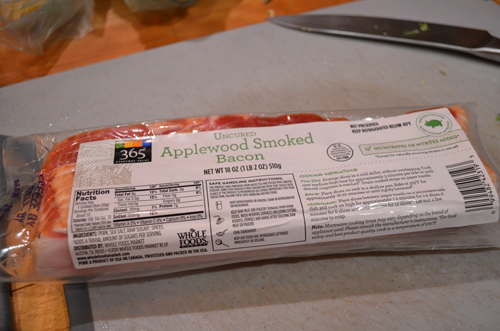 My favorite bacon to use for this dish is the Whole Food’s brand of uncured applewood smoked bacon — it is thick cut with a good meat to fat ratio, and has a slight but not overwhelming smoke quality to it. Happy New Year! 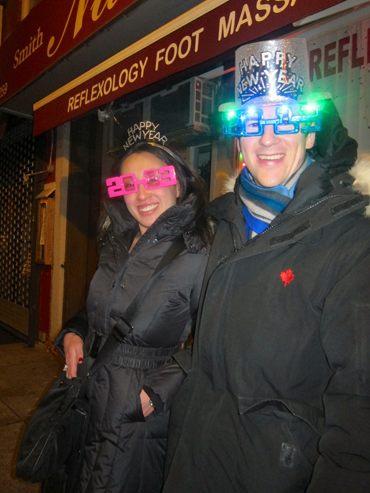 I hope 2013 is off to a great start for everyone. David and I had a terrific holiday season, and I have quite a few recipes to catch up on! First, dinner from last night: a very simple roasted duck. We recently introduced whole roast duck into our dinner repertoire. Previously, roasting a whole duck somehow seemed more labor intensive than roasting a whole chicken, but it’s really not that different. 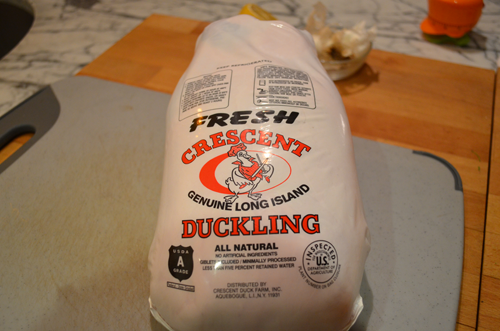 If you get good, fresh duck — and we get lovely Long Island duck here in New York — then a simply roasted duck is delicious. I also love getting all the fabulous duck fat after roasting a whole duck, which I like to strain and keep so that I can use duck fat to roast vegetables (SO GOOD).